Next Tuesday, June 12, 2018, the City of Las Vegas Planning Commission will vote on a proposed text amendment to the Las Vegas Boulevard Scenic Byway Overlay District (SB-O) which will allow for the inclusion of “changeable electronic messages” (LED video signage) on this portion of Las Vegas Boulevard. If approved, the text amendment will continue on to the Las Vegas City Council for final approval. Nevada Preservation believes this proposed text amendment will have significant consequences on the scenic byway and will ultimately lead to the removal and degradation of neon signage in this corridor. Please help protect the scenic byway by voicing your opposition at the upcoming Las Vegas Planning Commission. Join us in opposing this text amendment at Planning Commission this Tuesday, June 12th at Las Vegas City Hall on Main Street. The item is listed towards the end of the agenda as item 109. You can view the full agenda and back up documentation here. We will be arriving about 8:00pm, and will be seated in the back right area of the auditorium. If you are not able to join us at Planning Commission, you can also submit your comments online here. Be sure to reference case #TXT-73377. The intent of the SB-O is to “preserve its character as a nighttime scenic byway” while encouraging the maintenance and enhancement of the existing scenic qualities of the historic highway. The proposed text amendment conflicts with this intent. Negative impacts of the proposed text amendment include incentivizing the removal and/or discordance of neon signage on Las Vegas Blvd and the degradation of the existing historic character and quality of the scenic byway. Undermines the vision and goals set forth in the downtown master plan Vision 2045, which emphasizes the scenic byway as an important identifying and unifying corridor in downtown Las Vegas. The Las Vegas Visitors and Convention Authority (LVCVA) recently conducted a qualitative survey which identifieshistory and culture as the main reason tourists visit downtown Las Vegas. The proposed text amendment endangers the history and culture tourists come to see. 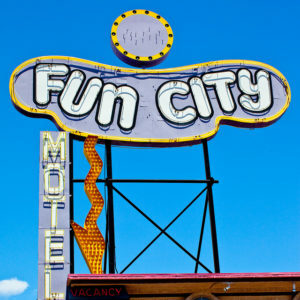 Undermines economic diversity and the growth of heritage tourism in downtown Las Vegas. Please note that our message is strongest with in-person attendance at the Planning Commission meeting. We highly encourage you to attend. The SB-O was created by the City of Las Vegas in response to the downtown community’s desire to preserve the existing historic character and quality of Las Vegas Blvd, between Sahara Ave on the south and Washington Ave on the north. Emphasis is placed on the preservation of (neon) signage which contributes to the boulevard’s identity as a nighttime scenic byway. The SB-O is intended to set restrictive signage standards that promote the rehabilitation, reuse, and re-creation of neon signage in the designated corridor. Specific standards include a requirement that all signs must incorporate illuminated signage into at least 75% of the total sign surface, in the form or neon and/or illuminated signage. The city currently excludes the use of changing electronic messages (LED video) within the City of Las Vegas. Allowing this type of technology in the scenic byway would likely see the removal and discordance of neon signage in the corridor. Read the entirety of the ordinance here. 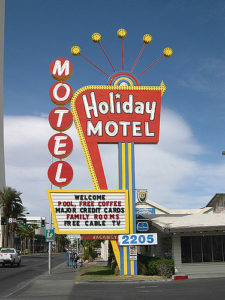 Although the scenic byway has changed over time, the SB-O has significantly influenced the revitalization of neon signage in the downtown core. According to the downtown master plan, Vision 2045, the recent resurgence of downtown is attributed to three main stories, one of which is the designation of the Las Vegas scenic byway (pg 319). We refuse to let this important corridor be jeopardized without a fight! Please join us in advocating for the preservation of the scenic byway, and let Planning Commission know that you oppose the proposed text amendment to the SB-O!